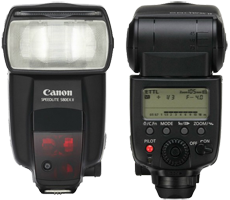 Boston Photo Rental’s selection of Canon flash equipment helps you make sure that your shoot goes off without a hitch. Contact us to reserve a flash today! 580EX II Speedlite Further development of Canon's flagship Speedlite flash has led to the production of the 580 EX II. This is the premier Speedlite for all photographers and has been newly designed to match with the EOS-1D Mark III in terms of improved dust- and water-resistance, body strength, and the ability to control flash functions and settings from the camera menu (EOS-1D Mark III only). Other features include improved communication reliability through its direct contacts, and recycling time is both 20% shorter than the 580EX and is completely inaudible. 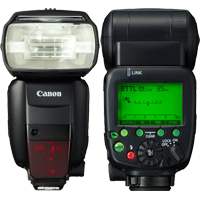 600EX-RT Speedlite Canon's new Speedlite 600EX-RT is engineered to provide a new level of performance and reliability for professional flash photography with today's most advanced DSLRs. With wireless two-way radio communication, the Speedlite 600 EX-RT allows photographers to expand their creativity using wireless speedlites with the reliability of radio triggering. 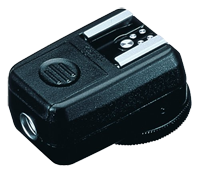 The Speedlite 600EX-RT offers an expanded zoom range and a higher guide number, plus a number of improvements over its predecessor in both operation and feel. It features a new dot-matrix LCD panel for display of all pertinent shooting information, backlit controls plus an internal sound generator. 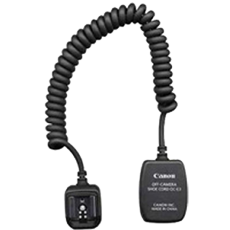 Off Camera Shoe Cord The Canon OC-E3 is convenient for using your flash apart from the camera. It also allows for remote triggering of the flash, making it perfect for all studio setups. Hot Shoe To PC Adapter The Hot Shoe to PC Adapter allows for control of up to four Speedlite flashes. This increases the versatility of your flashes and gives you better lighting for your photos.